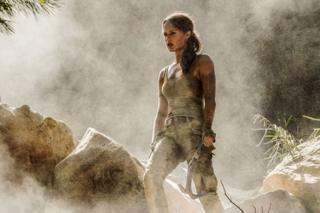 It's dusty work being a Tomb Raider, as the first picture of Alicia Vikander as Lara Croft reveals. The Swedish Oscar-winner takes over from Angelina Jolie in the latest film to be drawn from the popular video game franchise. Described as a reboot, the film is said to be an origins tale drawn from the plot of the Tomb Raider game released in 2013. Directed by the fabulously named Roar Uthaug, it's due out in March 2018. Vikander, who won an Oscar for The Danish Girl, describes Lara as "a truly iconic character" who acts as "a model for many young women". "She's trying to carve out her place in the world and connect her future with her past," the 28-year-old told Vanity Fair. Norwegian director Uthaug said the film - which also stars Dominic West as Croft's father - would focus "not only on Lara's strength and physical accomplishments but her humanity". "We see Lara as a young woman, smart and capable but largely unfocused, and follow her on a dangerous journey that will push her to her limits in every sense," he went on. Jolie previously played the role in 2001's Lara Croft: Tomb Raider and its 2003 sequel, Lara Croft Tomb Raider: The Cradle of Life.